Another favorite reprint – Enjoy! Just down the road from my house is a restaurant/gathering place/watering hole called Nick’s. Nick’s is a legendary seafood joint frequented by tourists and locals alike, by fisherman, national figures, and the occasional celebrity. Aesthetically, and I say this with affection, Nick’s is not much to look at. The building is constructed from whitewashed, concrete blocks, now decades old. The parking lot is often flooded with rainwater, and chickens roam about in the yard. The ceiling is too low for my liking, and the view of the surrounding bayou is obscured by windows a touch too dark. 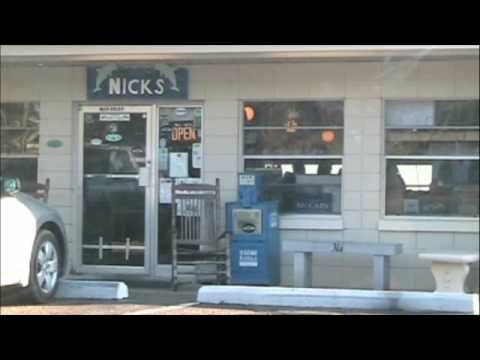 So if you were driving by, uninformed and uninitiated regarding this establishment, you might think Nick’s to be some notorious hole-in-the-wall dive, and keep driving. That would be your incalculable loss. For three generations, the Nick family has been serving glorious local seafood, shucking the best Gulf Coast oysters, and slinging the coldest brew around. Trey and Jennifer Nick, the restaurateurs that now operate this roadside oasis, keep the parking lot flooded alright; flooded with cars. People just can’t stay away. This has a lot to do with the food, of course, but that’s not the main draw. The Nicks know how to make you feel welcome. They make you feel at home. And what the atmosphere lacks visually, it more than makes up for with sincere friendship. Now, this doesn’t mean I like everything on the menu, the low ceiling, or all of the Auburn University apparatus hanging on the walls. But I love being there, and judging by the time it takes to get a table, I’m not the only one. The church could learn a few things from the Nick family. Their success is not the result of clever marketing, pumping thousands of dollars into publicity campaigns, or arguing that their food is better than some competitor down the street. No, the Gospel According to Nick’s is quite simple: Welcome people as friends, surround them with love, and then send them out satisfied, with joy in their heart and a good word to share on their lips. I have no argument against some of these things. I like technology, beautifully built buildings, the smell of new paint, and parking lots that don’t flood. But like many folks, I would rather wade across a river in hip-boots to be with people who care about me – to be in that place “where everybody knows your name,” than to be treated like just another consumer through the turnstiles. Let’s face it: Elegant buildings, comfortable parking lots, expertly executed marketing plans, Disney-ready children’s programs, and stage-practiced Sunday services will draw a crowd; a big crowd. But for all their ingenuity, these things may not build relationships, foster discipleship in the way of Christ, or sustain community. The only way people are going to care about anything we have to say will be when they know we care about them as unique, distinct individuals, and not as a means to padding our pews and our coffers. The Nicks are right. Treat people like family. Feed them well. And send them on their way with joy.